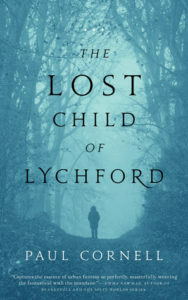 The Lost Child of Lychford is the sequel to The Witches of Lychford, and I don’t think it’s gonna make much sense if you haven’t read the first one. However, it’s a nice little addition to the world Cornell has created and I enjoyed it. I will be keeping my eyes on further books in this series/world and I’ll definitely check out Cornell’s other books. As it was established in the first book, Lychford is an important town located at the crossroads of many worlds. The boundaries of the town create the boundaries between our world and the many varied worlds of the spirits/fairies/gods/demons/devils/etc. And once again the plot revolves around some great evil trying to break into our world, this time at Christmas. On morning, as she’s working on the various Christmas programs for her church, the vicar Lizzie opens the door and sees a child’s ghost. Except the child isn’t quite dead yet, and she’s really distracted by all the goings on around Christmas celebrations. Her two witchy friends are similarly distracted and it’s a race to see if they can overcome their various distractions to save this boy and the world. As before, all three women are so well done, each one dealing issues which have been exaggerated by the evil magic trying to take over the town. The blossoming friendship between the three women, including the cranky Judith, is delightful. There’s another reoccurring character in Finn, a fairy- who is equally delightful, and there is a tentative alliance between humans and fairies against the demonic forces that Cornell is slowly building up. Honestly, I picked these because they were short and I’m stressed and not really feeling long, complicated novels right now. However, despite their length, there is a lot of plot packed into the short pages, and they’re really delightful. As I said, I’m quite fond of them and I look forward to seeing what else Cornell has in store for the little town of Lychford. Share the post "Cranky Old Women are Delightful to Read About"